^ 宋會群、苗雪蘭. 中國博弈文化史. 中國: 社會科學文獻出版社. 2010-08-01. ISBN 9787509716854 （中文（简体）‎）. ^ 馬建春. 《回族研究》〈大食双陆棋弈的传入及其影响〉. 中國: 宁夏社科院《回族研究》编辑部. 2001-04 （中文（简体）‎）. ^ Banaschak: A story well told is not necessarily true - being a critical assessment of David H. Li's "The Genealogy of Chess"
^ 崔樂泉. 《中國古代體育發展史》. 中國: 文津出版社. 2010-11-01. ISBN 9576689279 （中文（简体）‎）. ^ 12.0 12.1 李松福. 《象棋史话》. 中國: 人民体育出版社. 1981 （中文（简体）‎）. ^ 王端. 《古錦圖案集》. 中國: 四聯出版社. 1955 （中文）. ^ 楊力. 《中国的丝绸》. 中國: 人民出版社. 1987-02-01. ISBN 9787500730071 （中文（简体）‎）. ^ 張展. 《象棋人生》. 中國: 經濟管理出版社. 2012-12-01. ISBN 9787509621394 （中文（简体）‎）. ^ notation An Introduction to Chinese Chess : Game Notation 互联网档案馆的存檔，存档日期2008-08-21. Lau, H. T. Chinese Chess. Tuttle Publishing. 1985. ISBN 0-8048-3508-X. 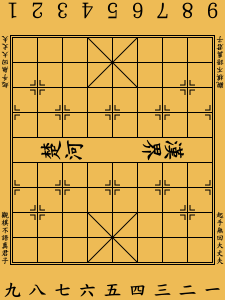 Li, David H. First Syllabus on Xiangqi: Chinese Chess 1. Premier Publishing, Bethesda, Maryland, 1996. ISBN 978-0-9637852-5-1. Li, David H. The Genealogy of Chess. Premier Publishing, Bethesda, Maryland, 1998. ISBN 978-0-9637852-2-0. Li, David H. Xiangqi Syllabus on Cannon: Chinese Chess 2. Premier Publishing, Bethesda, Maryland, 1998. ISBN 978-0-9637852-7-5. Li, David H. Xiangqi Syllabus on Elephant: Chinese Chess 3. Premier Publishing, Bethesda, Maryland, 2000. ISBN 978-0-9637852-0-6. Li, David H. Xiangqi Syllabus on Pawn: Chinese Chess 4. Premier Publishing, Bethesda, Maryland, 2002. ISBN 978-0-9711690-1-2. Li, David H. Xiangqi Syllabus on Horse: Chinese Chess 5. Premier Publishing, Bethesda, Maryland, 2004. ISBN 978-0-9711690-2-9. Sloan, Sam. Chinese Chess for Beginners. Ishi Press International, San Rafael, Tokyo, 1989. ISBN 978-0-923891-11-4. Wilkes, Charles Fred. A Manual of Chinese Chess. 1952.